We all know about Pushkin Press’s sterling work in recovering lost classics of European literature, but they also publish contemporary European fiction. The slightly creepy cover of Alain Elkann’s Envy (despite the French forename, he’s Italian) drew my attention – though it’s only when you turn to the back and see long curling hair growing from the wooden head that it really makes you shudder. 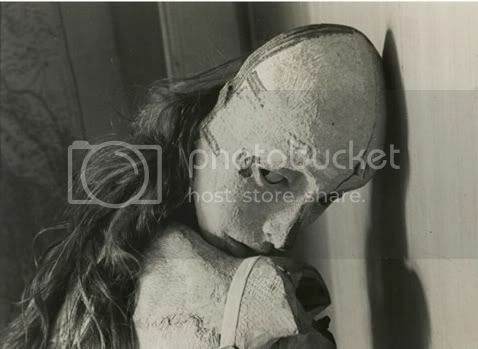 (The image is of La Poupee by Hans Bellmer.) Does the book catch the brain as easily as it catches the eye? Envy succeeds through clarity, brevity and a sort of disarming openness which makes it almost impossible not to read in one sitting. At 115 pages of large type, plenty of blank space, and an addictive just-one-more-chapter quality, this is no great task. Maybe because I’m always on the move and he’s always in the same place. Maybe because I fritter away my time and he’s focussed. Maybe because everything he does is over the top and I’m too cautious. … Maybe I envy him because I would have liked to have his destiny. Most of all he envies Sax “the security of a talent confirmed by critics, collectors and market prices all over the world.” When someone criticizes Sax – “he is a perverse man, an egotist” – his only response is “But he is a great artist.” What follows is an addictive spiral into obsession, which doesn’t stoop to tricksy narrative games: what’s refreshing is that the narrator is always aware of his own weaknesses, and the risks of what he is doing, but the story is no less gripping as a result. The conclusion, veering into metafictional territory, is deft and surprising. The delightful thing about marriage is that there’s no need to hurry. There is none of the stress of having to take leave of one another, of not knowing when you will see each other again. There is a tenderness, recreated every day, every night in bed and that is the basis of marriage. … Marriage is not about novelty, and even the most curious people don’t want novelty all the time. We grow fond of things that have been used, mended, resoled, repaired, because they have become truly ours. And not a mention of Lucien Freud. Well done! How do you do it? It’s good to see you enjoyed this one too. Bloody hell, another one I have to buy. And not a mention of Lucien Freud. Well done! JRSM, you seem to be cursed with the crappiest identicon of anyone who has commented on my blog. Sorry. Off topic for a second, but what’s the deal with these identicons? Where’s my usual photo gone? You got an identicon last time because you used different details than usual – your URL was your own review of Envy rather than your normal WordPress login which has your profile photo. Normally they only appear for people who don’t have a login ID – and the image should stay the same as long as the person uses the same email etc each time they leave a comment. I am completely unfamiliar with this writer – thanks! Hope I can find this book. Let me know what you think of it if you do read it, Ted and Isabel. It won’t take long!